Found in open eucalypt forest and timbered areas, including cultivated land and orchards. The head, neck and underbody of males are mostly red, while those of females and juveniles are mottled red. The cheek patch is yellow or cream. 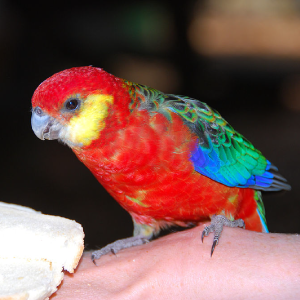 The Western Rosella is the only rosella with yellow cheek patches. Photo by Robert Young (originally posted to Flickr as Friendly parrots) [CC BY 2.0 (https://creativecommons.org/licenses/by/2.0)], via Wikimedia Commons. Photo has been cropped.